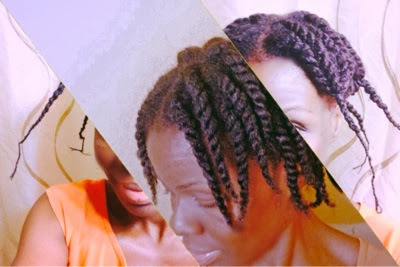 I believe that our hair should have regular resting periods between long-term protective styles. This allows for a complete examination of our hair condition, so we can correct the flaws. 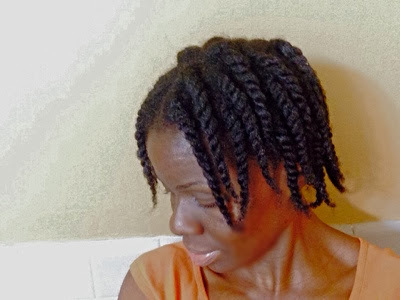 For me, some of my ends are not smooth and dry, and since I have not had a trim for a long time, I decided to get one. Also, When I wear "out" styles, I want them to look full. This is why I need the Aesthetic Maintenance, which is according to "The Science of Black Hair, is simply the act of "evening up hair that has overgrown and it gives a fuller appearance to the hair's hemline/ ends regardless of condition." Preventive maintenance is what most people use to remove old and worn out ends, regardless of the condition. Like I mentioned above, some of my ends feel rough and dry, and are not curling up like they used to. I do not use heat so it may be due to the fact that my ends are worn out. 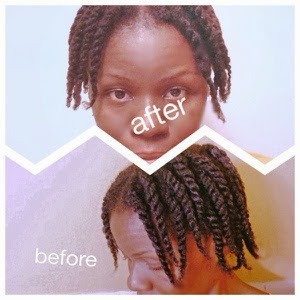 After twisting my hair, I threaded just the ends of the twist to keep my ends stretched. They were threaded while damp. I did this to stretch my hair a little bit. I usually prefer to wear my hair a bit stretched anyway, so it will make sense to trim with slightly stretched hair. Shrinkage gives me knots and breaks my hair. My point is trimming my hair while wet because my hair is coily will not work for me because I keep it slightly stretched. 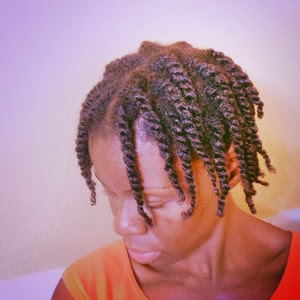 So I am trimming in slightly stretched twists. I removed the threads before my hair was completely dry because I did not want super-stretched hair. I wanted it to have some curls at the end since my hair is never straightened anyway. I trimmed about 1/2 inch of the ends of my twist in a straight line and used my finger as a guide. I trimmed generously because I want my hair to look full when I do the "out" styles. It is amazing what a good trim does, isn't it? I am still contemplating my own trim . . . well, actually a cut. Yours looks very good, though. Good post. You hair looks wonderful. Yes I am glad I did and wil not shy away from trims anymore.